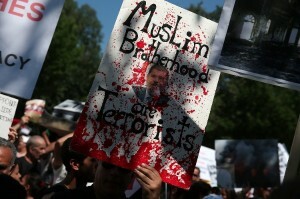 Egyptian Interim Prime Minister Hazem el-Beblawi Tuesday declared the Muslim Brotherhood, the country’s oldest and most influential Islamist movement, a terrorist group, official news agency MENA reported. The announcement came after a powerful explosion ripped through a police station in Egypt’s Nile Delta city of Mansoura early Tuesday, killing at least 14 people and injuring 130 others. “The Brotherhood has shown its ugly face as a terrorist group and its acts will not weaken the Egyptian people’s determination to move forward,” Beblawi was quoted by his media adviser Sherif Shawqi as saying. In October, the Egyptian authorities ordered to remove the Muslim Brotherhood from a government list of accredited non-governmental organizations. Earlier, a Cairo court also ordered to ban all activities of the Brotherhood group, seize its funds and form a panel to administer its assets. Meanwhile, thousands of protesters took to the streets in Cairo on Monday against the prison sentencing of three leading secular pro-democracy campaigners, Ahmed Maher, Ahmed Douma and Mohamed Adel, considered by some to be symbols of the uprising that toppled President Hosni Mubarak in 2011. The US has released a statement criticising the military government for “worsening climate for freedom of assembly and peaceful expression in Egypt”. “We believe that the verdicts issued December 22 do not contribute to an open electoral environment or a transition process that protects the universal rights of all Egyptian citizens, and therefore should be reviewed,” State Department spokeswoman Jen Psaki said in a statement. The protesters in Cairo on Monday chanted against the military-backed government, calling army chief General Abdel Fattah al-Sisi “a dog”.